No pressure, great people and a fun Mini. Second one I have owned and hope to have a third. Great and warm experience. No pressure and took care of all my needs. The Team at Baron - Isaac, Ameer, Bill and the entire team are an amazing crew. Surgically focused on customer service and attention to detail, I couldn't imagine bringing my Mini anywhere else for service. They've been servicing my 2007 Mini for over 10 years and I can't recall one issue that wasn't handled with the highest level of professionalism and service. One word describes the experience you'll receive at Baron - STELLAR! Thanks again to Bill, Ameer and Isaac for making it simple and painless. Our mini (r.i.p.) broke down on vacation and we managed to make it here. They set a high bar for service and helpfulness and it is no fluke--each person was top notch. End of the night and she died departing so we took a loaner from them to get to Enterprise so we could get home. The parts counter person was friendly too. They overcharged us and though we were from out if town and would never have realized it, they sent a refund check! These guys are the best and always give top shelf service. Always provide excellent service on our Mini. As always Baron Mini is the greatest! Amir comes through for us every time. I'm always impressed by your staff's professional attitude and attention to detail. Great people and their knowledge of the Mini experience. Very pleasant to work with. Thanks. I recieved great service. They helped get the car back on the road and dod a great job and very helpful. I will be going back next time I have a problem. Baron MINI service once again took great care of me and my Cooper. Amir got me in and out at check in and check out quickly without making me feel rushed. He was readily available for all my questions and kept me informed of my car's progress. My car was ready when expected and delivered to me clean and sparkling.Great job everyone at Baron MINI service! Professional in every way. My my service advisor(Amir Tammehr) advised me through the entire process. My car was ready @ the time it was promised to be ready. 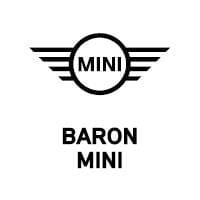 I highly recommend Baron Mini.